2. Mix espresso powder with boiling water, leave to cool. 3. Sift flour and baking powder together, set aside. 4. Whisk egg yolks, salt and sugar together until pale yellow and about 3 times the batter volume. 5. Add oil, espresso, evaporated milk and coffee oil into the egg yolk batter and mix till well blended. 6. Add flour mixture into the egg yolk batter. Whisk until well combined. 7. Use a mixer, start beating the egg whites. Add cream of tartar once the whites are foamy. 8. 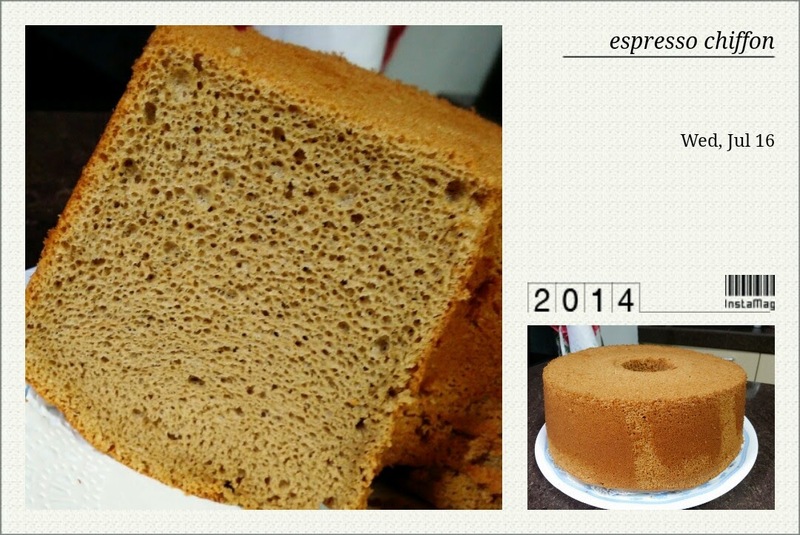 Once reached the soft peak stage, gradually add in sugar and beat till moist stiff shiny pointed peaks form. 10. Then fold in the rest of the meringue in two portions lightly until well combined. 11. Pour batter into a 23cm tube pan, smooth the surface. 12. Place pan into a preheated oven and bake for 45-50mins. 13. Remove from oven, invert cake onto table top and leave it cool. 14. Remove cake from pan and serve.